You are here: Virgin Islands News Online » News » Phillip off to NCAA Women’s basketball Championships! Phillip off to NCAA Women’s basketball Championships! 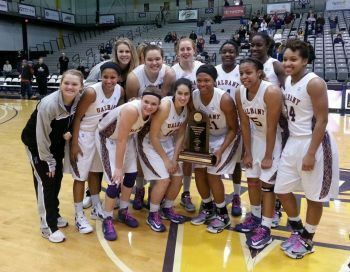 ROAD TOWN, Tortola, VI – Tamara Phillip and the University of Albany women’s basketball team claimed its second-straight America East title with a 61-52 win over No. 2 seed University of Hartford in the 2013 America East championship game on Saturday night, March 16, 2013 at SEFCU Arena in Albany, New York. Tamara who had such a successful season last year at Central Arizona is the only Junior on the team and next season will be taking a more commanding role. She will also be joined by sister, Tafara, who is also now attending Albany after completing her finals at CAC. The Great Danes (27-3, 16-0) became just the fourth team in America East history and the first since Maine in 1996 to go unbeaten in the America East regular season and go on to win the conference tournament title. Albany also became just the fourth school in America East history to win both the men’s and women’s titles in the same season. Northeastern accomplished the feat three-straight years from 1985-87, while Boston U. did it in 1988 and Vermont in 2010. The Great Danes ended the game on a 9-0 run over the final 1:30, breaking a 52-52 tie and earning the team’s second-straight trip to the NCAA tournament. The Great Danes finished the game shooting 44.2-percent from the floor and held a 38-31 rebounding advantage over the Hawks. Phillip finished the regular season having played 20 games off the bench, hitting 15 field goal attempts and one 3 pointer. She shot 75% from the free throw line going 15 of 20 for a season’s total of 46 points and picked up 69 rebounds with 42 being defensive, for an average of 3.5 per game. She added 14 blocks, 5 steals and 12 steals. Albany has won 28-straight games over America East opponents dating back to last season, and are the first No. 1 seed to win the America East title since 2008. The Great Danes are only the fourth team since 2002 to win both the conference regular season and tournament titles. 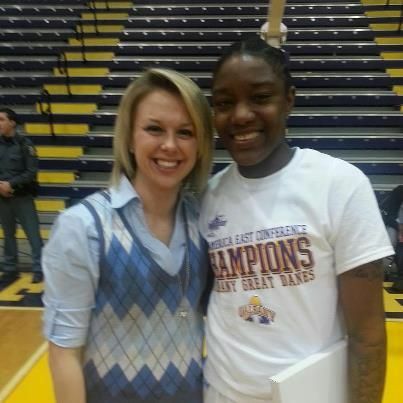 Congratulations to Tamara and best of luck to both the womens and mens teams in this years March Madness. Go Danes.